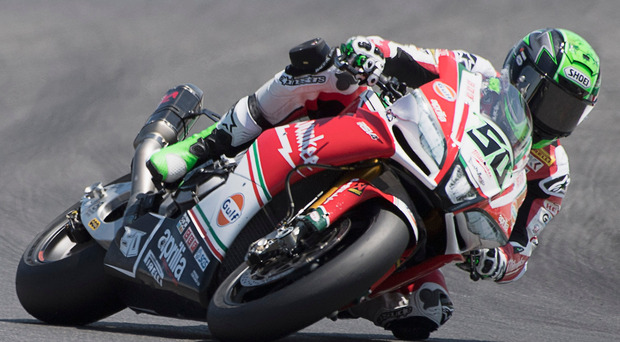 Eugene Laverty, who is currently without a ride for 2019, set the fastest lap of the day during yesterday's third practice session for the final round of the World Superbike Championship in Qatar. The Ulsterman recorded a time of 1m 57.323secs, a tenth of a second clear of compatriot Jonathan Rea. Rea, who has already won this season's Championship - his fourth in a row - and was a faller in the opening practice session, had Kawasaki team-mate Tom Sykes breathing down his neck a further fifth of a second back in third. Alex Lowes, who was fastest in session two, ended the day fourth fastest, with Laverty's Milwaukee Aprilia team-mate Lorenzo Savadori fifth and Loris Baz sixth. Laverty, Rea and Sykes had traded fastest lap times before the Toomebridge man finally nailed it with a minute and a half remaining in the session. Rea said: "After what has been an incredible season, I want to try and finish it off on a real high and then have a few weeks' downtime before we start winter testing. "It's important we do a good job here in Qatar and, like the previous races, we aim to try and win." Earlier in the day, Rea had been out of the blocks sharpish during the opening practice session, setting the target time on only his third lap with a stunning effort of 1m 59.290secs. Two corners later he lost the front end of his Kawasaki ZX-10R and tumbled off into the gravel uninjured, forcing him to watch the rest of the session from the sidelines. Rea's time was not challenged by any other rider until the closing minute of the session when Laverty, on his Milwaukee Aprilia, went three quarters of a second faster than the Templepatrick ace. Laverty will be hoping to impress this weekend as he is aiming to pick up a seat for 2019 after not having his contract renewed by the Aprilia team, Sykes being named as his replacement in the new SMR BMW side. Sykes was down in ninth position after the opening session. Session two saw the times tumble with Pata Yamaha rider Lowes setting the fastest time with a 1m 57.656secs, just 0.025sec ahead of Laverty. The pair were the only riders to get into the 1m 57sec bracket. Rea bounced back from his earlier crash to set the third fastest time, half a second behind Laverty. Sykes leapt up to fourth fastest, as less than a second covered the top eight riders. With final qualifying and the first race this evening under floodlights around the 3.362-mile Losail Circuit, Rea - who as well as securing his record fourth successive world title helped Kawasaki to the manufacturers' and team awards - is still in with a chance of breaking more records, including most race wins and most points in a single season. The 31-year old is just one victory away from matching American Doug Polen's 17 wins in one season with two races remaining, while a win in either today's race or tomorrow's second race would make him the most successful rider with one manufacturer (56 wins for Kawasaki). And he is just 36 points behind his own record of 556 points accumulated in 2017. Meanwhile, after the success of last year's Beach Race, the event returns to Portrush East Strand tomorrow and Sunday supported by Causeway Coast and Glens Council. Bumper crowds attended last year and the show is free for action-packed races for two, three and four-wheel machines. The action gets under way at 10am tomorrow and 12pm on Sunday.